BASKETBALL SPOTLIGHT NEWS: A Grand Night For Tankley! Last summer Jaheim Tanksley traveled to the Basketball Spotlight Future Phenom Camp and put in some work. The point guard played so well he made the Top 20 game and finished the camp Ranked #19. We have yet to see Tanksley on the AAU circuit but he has been still balling hard on the school scene. 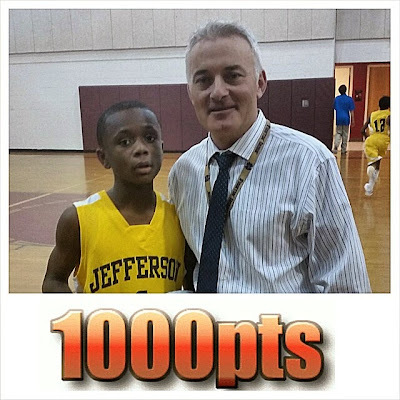 Jaheim who attends Thomas Jefferson Middle School in Edison, NJ recently scored his 1,000th point against South River MS. Tankley remained humble after reaching this goal. “It’s a blessing and a great accomplishment of scoring a 1,000 points in middle school. Now I’m going to focus on continuing to practice, get better and get ready for high school” he said. Basketball Spotlight would like to congratulate Jaheim and wish him success the rest of the season. We look for forward to seeing him on the floor again very soon.